Anthem is one of the more anticipated titles coming to Gamescom 2018, and while we didn’t get to experience it hands on, I was lucky enough to have been able to watch live gameplay. The demo starts with some dialogue followed by every player picking their Javelin exo-suit. The walker you are riding halts, and the players jump down, and quickly jet off to explore their surroundings. 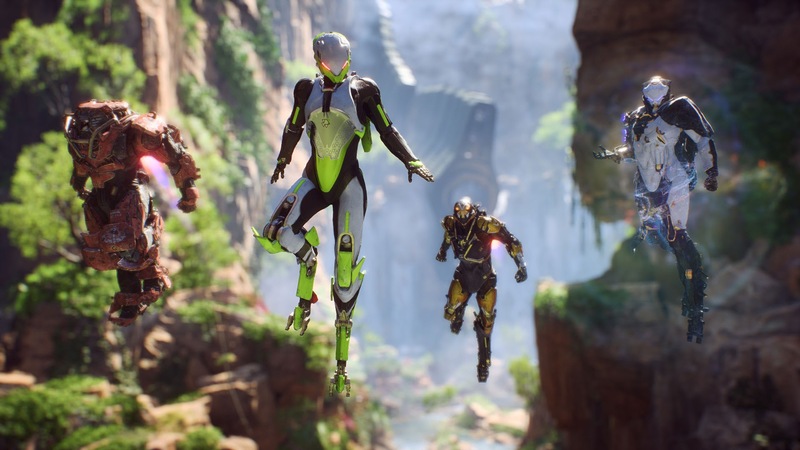 Anthem allows you to fly whenever you want. You can hover in place, or fly to where you are aiming your sights, all with very intuitive controls and UI. One of the players flies under a waterfall, showing off the capabilities of the Frostbite 3 engine. It’s one of my favorites, especially after seeing what it can do in Star Wars Battlefront 2 and now this Anthem demo. There is also quite a lot of wildlife around, although you can’t interact with it, at least not in the demo. The devs explain that the full game to have the same quality of story and content that we’ve come to expect from (most) Bioware games, and I’m very hopeful that the game will be as fantastic as previous projects like the Mass Effect trilogy or Knights of the Old Republic. Also, the game will focus less on romances and more on friendships – something quite new to BioWare. The demo has the team heading into Scar territory to find a relic and turn it off before it becomes dangerous to the area. A shootout soon follows at a barricade at the mouth of the cave. 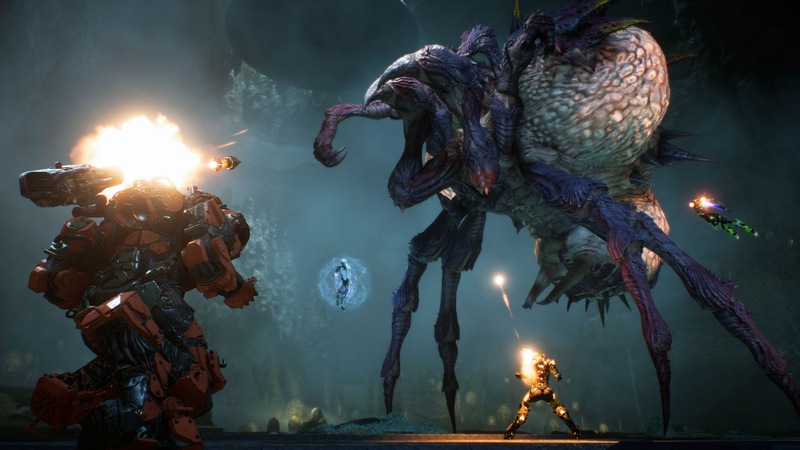 You can see the gameplay itself resembles a lot of other shooters at its core, with health and ammo pickups, and multiple weapons and grenades for each Javelin. The team fly down a cliff and quickly enter a submerged cave for some underwater exploration. It’s clear the game maps have a strong focus on verticality. Upon emerging out of the water, they enter a cavern filled with mines, and the Colossus of the bunch uses his shield to activate and take them out. It is then that the team arrives in the Monument Valley, and has to battle mobs in many different locations to collect echoes to quiet the relic. It’s a good opportunity for the players to rack up the kills and charged up their ultimate attacks. I only got to see the Ranger Javelin’s ultimate attack, which lets the player lock onto multiple enemies and rain down a barrage of rockets. We’ve seen this attack in the reveal trailer, where it looked a bit too powerful to be a regular move. It’s nice to know this is a special attack that serves as a tactical purpose, and not something you can spam. During this long fight, the Freelancers encounter a new kind of enemy holding a large protective shield. It looks like flanking this enemy is enough to take it out, and it doesn’t require any sophisticated attacks to take out. However, the team cooperated and combined the Ranger Javelin’s frost grenade with hits from the Colossus Javelin to land deadly elemental combos. These kinds of elemental combos are essential to good cooperative play and will allow players to deal more substantial damage. The team eventually finishes off the mobs and collects the last of the echoes to shut down the relic. From there, they move to a nearby cave to find some anomalies and battle hordes of spider creatures. The demo fast-forwards, and we arrive in an area called The Hive right in front of a corpse of a dead spider. It is then that the Swarm Tyrant boss appears – a creature we haven’t seen at E3. From the bit I have seen, the boss looks a lot like a damage sponge and doesn’t attack in unique ways or pose a significant threat to the players. That could change in later phases of the boss, but since I have only seen very little of the battle, I wasn’t able to judge it fully. That was the end of the Anthem Gamescom demo. The game looks much more down-to-earth and much less like the prototype with scripted events and rehearsed gameplay we first saw a couple of months ago. With actual players piloting the Javelins, the game looks like something worth getting excited about. I still can’t imagine how well the game would work in single-player since the players had to cover a lot of fronts and battle many enemies at the same time. I hope BioWare decides to show us the difference between co-op and single-player in future demos, though the game is very focused on co-op at the moment. 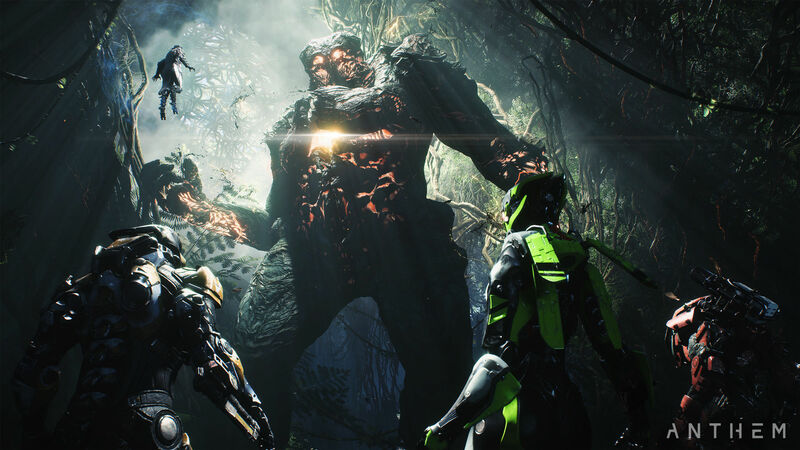 Anthem will release on February 22, 2019, for PC, PlayStation 4 and Xbox One.